Alessandro Gentile and Olimpia Milano are about to part ways since the Italian player is expected to continue his career abroad, on loan. 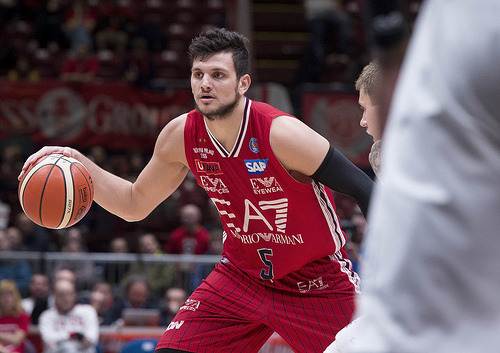 Alessandro Gentile and Olimpia Milano are about to part ways and the player is expected to continue his career abroad, on loan. As Gazzetta Dello Sport reports, Olimpia Milano president Livio Proli and the Italian forward met this morning and came into a mutual decision regarding the whole matter. An official joint statement describing the details is expected to be announced soon. The plan is for Gentile to be given on loan, most likely in a Euroleague team if possible, and when he will return to Olimpia Milano after the end of the season, the two sides will discuss his future in the team from a new basis. The 23-year-old player’s contract with the “Red Shoes” has a duration until the end of the 2017-2018 season. As of today, Olimpia Milan President, Livio Proli, and Alessandro Gentile mutually agreed on a solution that will allow the player to finish the remaining part of this season in a different club. Olimpia Milan thanks Alessandro for his great contribution and wishes him to find the right path for his expectations and potential. Alessandro Gentile desires to thank from the deep of his heart Mr. Giorgio Armani for giving him the opportunities received during the years spent in his basketball project, the Olimpia organization for the time and the victories and finally all the Olimpia fans for the love they showed to him during his time in Milan.